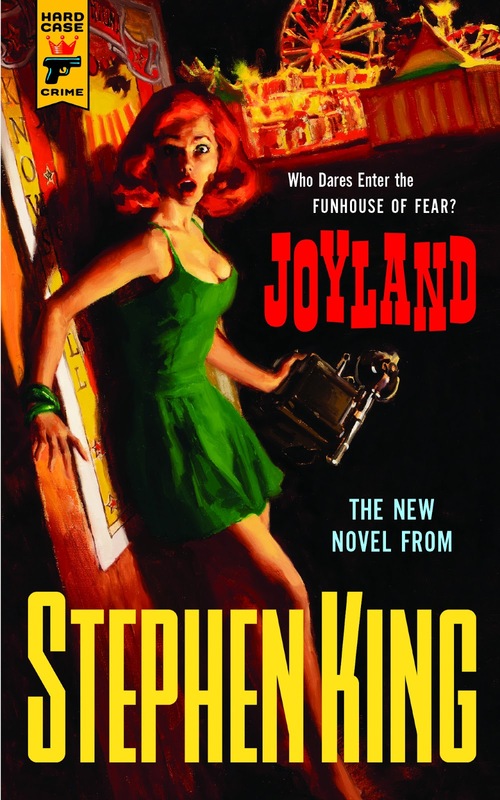 So I was expecting Joyland, a new King novel published by Hard Case Crime (a pulp crime publisher) to be a murder mystery with a healthy dash of horror – especially because the action was set in an amusement park and the murder that was a mystery happened in the park’s house of horrors. What I got instead was a coming of age story, shot through with a heap of heartbreak and plenty of healing. Devin Jones gets a summer job working at Joyland, and soon finds out his girlfriend has been cheating on him. She doesn’t even have the courtesy to break up with him properly, writing him a letter instead. Heartbroken, Devin throws himself into work, forming relationships with people that will last a lifetime, and a connection to a place that he will never forget. King gets the murder in early. On the day of his job interview at Joyland, Devin goes to meet his future landlady, who fills him in on all the juicy details. A young girl and her lover went into the house of horrors, and the young girl never came out. There are plenty of pictures of the couple together around the park, but none in which the man’s face can be seen. And it’s said the girl, Linda, still haunts the place she died, while the killer has never been found. Devin arrives at the park a few years after the murder, and finds himself quickly captured by the story. But King’s novel, unexpectedly, shifts the ghost story, and even the crime solving, to the backseat as Devin finds himself a star at Joyland, fitting right in with the carnies (even using the slang they have), so much so that he decides to not go back to college and stay at the amusement park for the year instead. The deepest bonds in the book are formed between Devin and Erin – one of his housemates and one of Joyland’s Hollywood Girls. The pair keep in touch for years, and Erin’s husband is in fact one of Joyland’s other summer workers. Joyland, narrated by a Devin 40 years older and wiser, is full of tidbits from Devin’s whole life as well as his summer at the amusement park. And Devin also forms a deep bond with a child named Mike, who is wheelchair bound because of his muscular dystrophy, and Mike’s mother Anne. This comes quite late in the book, so I won’t spoil anything for you, although the pair are mentioned frequently throughout. King’s novel is pulp fiction, matching its garish cartoon cover, but it’s surprisingly moving and so full to the brim it will have you constantly examining every word in case you’ve missed something. Misery may have left me terrified, but Joyland helped heal any wounds I had left from my first experience of a King novel, just like Joyland helped Devin heal from his first heartbreak. How I got this book: Sent a review copy by the publisher (thanks!) in exchange for an honest review. I have also read exactly one Stephen King–Gerald's Game, in my case. Which is a book about a woman who is hand-cuffed to a bed in a cabin in the middle of nowhere with a killer on the loose. Which I made the mistake of reading overnight while all alone in my house after getting knee surgery. Terrifying. This sounds interesting and unexpected. I love the pulpy cover. Maybe I'll pick it up some time. Great review! I had to read Misery for one of my university courses, otherwise I'd never have picked it up. Your experience with Gerald's Game sounds terrifying. I can promise that Joyland, while a teensy bit scary at times, is actually a really good read. Trust me, I'm a huge scaredy cat and would never have got through this otherwise!